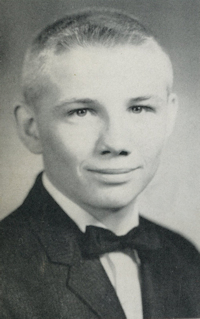 Obituary – Madden, Kenneth Lee « Perry High School Alumni Association, Inc.
F.F.A. 55-57; F.F.A. Treasurer 56-57; Wrestling 55-58; Lettermen’s Club 56-58. ﻿Funeral will be at 10:30 a.m. Wednesday at the chapel of Strode Funeral home of Stillwater for Kenneth Lee Madden, 46, Stillwater, who died last Wednesday in Linn county, Kansas. The Kansas Bureau of Investigatiion is involved in seeking information surrounding Madden’s death which is believed to have been homicide. Rev. Charley Baker will officiate. Private services for family members will be scheduled later at Summit View cemetery at Guthrie. Born Sept. 30, 1940, at Lucien, he was the son of Fred and Essie B. (Sult) Madden. He attended White school, west of Perry, and graduated from Perry high school and Lamar Junior College at Lamar, Colo. He received his bachelor of education degree from Oklahoma State university and taught at Miami, Putnam City, Blackwell and Bristow before returning to Stillwater in 1972. Madden was involved in the insurance, oilfield and asbestos contracting business. He and Celia Horene Hollar were married Feb. 28, 1960, at the home of her parents, Mr. and Mrs. Earl Hollar, southeast of Enid. Among survivors are his wife, Celia, of the home; a son, Kyle, of the home; one daughter, Darlene Madden Harper, Oklahoma City; one grandson, his parents, Mr. and Mrs. Fred Madden, Perry; one brother, Dale Madden, Portland, Oregan; and two sisters, Carol Woods, Cary, N.C.; and Mrs. Larry (Ada Jean) West, Tulsa.